There are trees and trees. I am not a particular fan of trees. They can be very misleading. Any feline can climb a tree, just dig in the claws and do the feline trick. That is the one that gets you to the top branch in a few seconds and leaves the humans admiring your ability. When you arrive on the top branch you are the chief feline, you can observe the world and have a satisfied “I did it” feeling in the whiskers. You might even meet a bird, but ignore it. They can fly away and you cannot fly. Many is the feline that watches the abiliti of a bird leaving the tree and then notices that you cannot fly. This is where problems arise. We felines are very clever and skilful, but somehow our bodies were not built so well for descending. 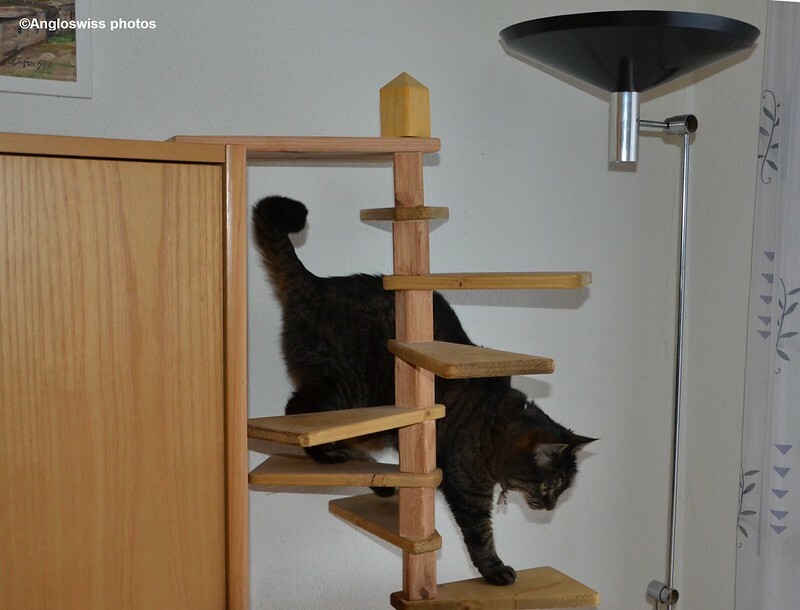 As you can see on this photo, I have everything under control, but this feline ladder was espeically designed for me. Trees are not designed for felines, and so many is the feline that sits on the top branch waiting for a rescue. I remember Bobinette, a feline that lived in the neighbouring territory. She has now moved away thank goodness. She was often infringing on my territoriy and we did not see whisker to whisker. Unfortunately she was bigger than me. So Bobinette chased something up a tree and the something left the tree but Bobinette could no longer descend the tree. Her human could not climb the tree and so there was a problem. In the meanwhile the human had thoughts about calling the fire brigade. Bobinette was now faced with a choice. Should she become the laugh of the feline neighbourhood by having a human climb a tree on a ladder to rescue her, or should she take the risk and jump. She decided to jump and being feline applied the magic landing position, where we arrive on all four paws without problem. Afterwards she was carried home by her human I believe – how degrading. So remember felines wherever you are. Do not climb trees. If you see your favourite meal chirping on a branch, let it chirp. Felines have a construction problem. We can ascend, but descending is to be handled with paw care. Yes humans often have strange memories. I do not climb trees because there is nothing worth climbing for. The mice here usually live in the ground, so who needs a tree. It is now leaf soldier time, so I am busy killing leaves that seem to drop from the trees. you cannot eat them, but it is a success for me. some of the leaf soldiers can even fly, but only when the wind is blowing. It is now getting colder outside, and my nights are now spent inside. When I was a kid, I had a cat named Mitzi who climbed trees. We kept our local fire department very busy getting her down. No matter how many times she had to be rescued, she never learned to NOT climbe up those tall oak trees. Some kitties aren’t quick learners.